There were high emotions at a benefit concert staged by Ariana Grande in Manchester less than two weeks after the terror attack following her gig in the city. But the show also demonstrated the power of pop music to bring people together. Several viewers took to social media to highlight the moment a policeman was seen dancing with young fans as a symbol of the city’s unity. 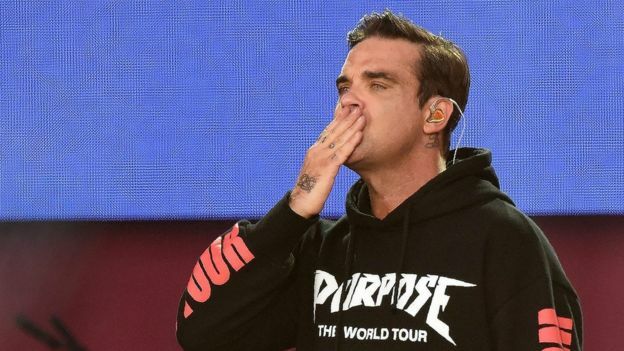 With a few tweaks to the chorus, Robbie has turned a minor 1998 hit into a rousing song to rally the masses in Manchester 2017. Everyone in the crowd could easily bellow the simple chorus, and Robbie bellowed it in between songs too. It even overshadowed his classic Angels as his main sing-a-long moment. Little Mix induced some of the most piercing screams of the night. The girl group explained that Wings is about encouraging people to “stand together and not let anything bring them down” – but their performance was the biggest slice of pure, escapist, plastic pop we had. So it was also the epitome of one aspect of what tonight was all about – defending the right to gyrate in PVC pants and conjure cliche-ridden fantasies, and for fans to lap up every second of it. Rubbing shoulders with the pop superstars were 26 students from Parrs Wood High School Choir in Manchester, who performed a tear-jerking rendition of Grande’s My Everything. They were invited to perform after putting their version of the track on YouTube in tribute to those who died in the attack. 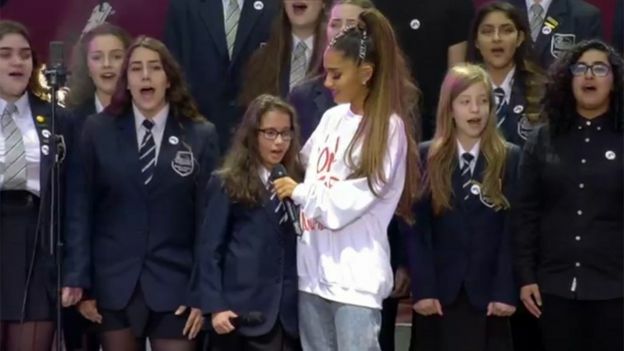 Angel-voiced soloist Natasha Seth, 12, was joined by Grande herself, who held the girl’s hand – then, as the emotion became too much for the youngster, put her arm around her shoulder and squeezed her tight. 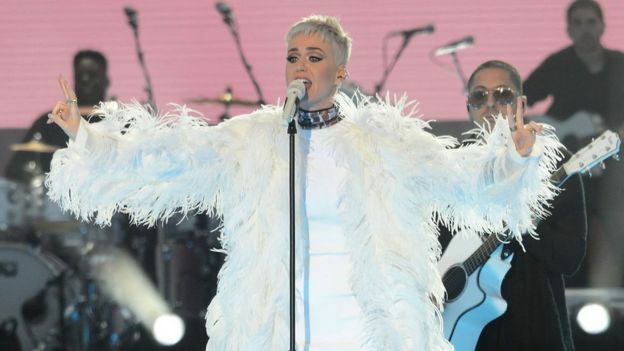 Of all the performers, Katy Perry captured the mood of defiance and strength the best. Part of Me hit exactly the right tone – reflective and empowering – before she unleashed her full-throated anthem of defiance, Roar. 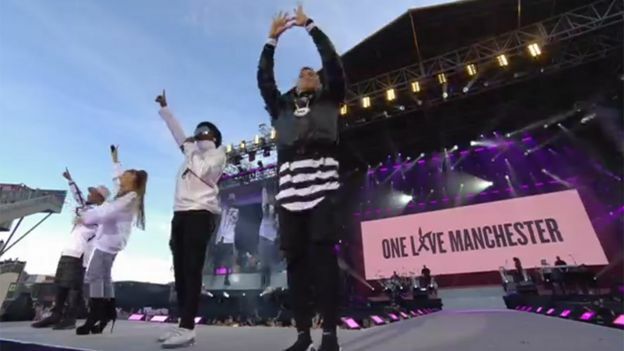 “Overseas, yeah, we try to stop terrorism/But we still got terrorists here livin'” – Black Eyed Peas, Where Is The Love? Almost 15 years after it was a mega hit, this song still sums up the incomprehension most people feel at the brutal ruthlessness of the modern world, while offering hope that it doesn’t have to be this way. Will.i.am did arrive on stage saying “Whassup London!” – but he just about got away with it by paying tribute to the capital as well as Manchester. Another song that has taken on new significance for Mancunians in the past two weeks is Oasis’s Don’t Look Back In Anger. 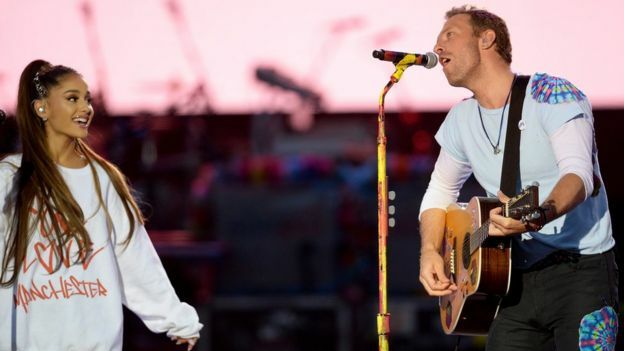 Here, it fell to Coldplay to perform it, with a little help from Ariana. Few bands can get a crowd going like Coldplay, and it was the first of four songs the band played. 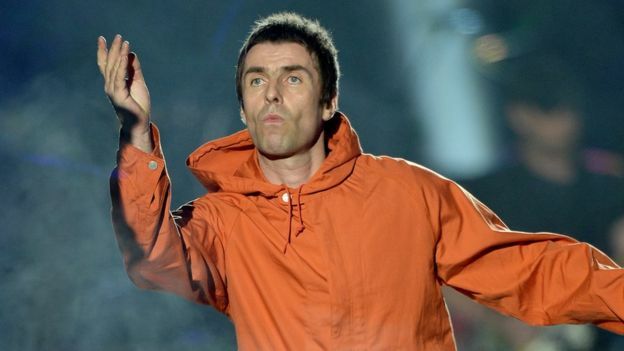 Former Oasis frontman Liam Gallagher was a surprise addition to the line-up, pleasing many of the Mancunian music fans and representing a different side of the musical spectrum to most of the other acts. And a song that was once all about bravado became melancholy and tender here. That was thanks in part to Chris Martin, again, who filled in for Liam’s brother Noel on acoustic guitar. We even just about forgave Liam for playing a new song, Wall of Glass. Of all of Ariana’s songs, this is the one that fans have turned to since the attack. It was the penultimate song here, which she sang with the rest of the line-up stood behind her. Her performance throughout the night carried dignified emotion, and she showed grit and willpower by staging this show less than two weeks after those tragic events. After tonight, she is idolised a little bit more by her fans, is higher in the estimation of those who had thought of her as a pop kitten, and is admired by those who only heard her name for the first time 13 days ago. Britain’s plan to introduce price caps in the energy retail market will be a “challenge” but also a chance for one of the country’s biggest suppliers to develop new products in a very competitive market, said the chief executive of E.ON (EONGn.DE). Britain’s Conservative Party, leading in polls to take a larger majority in next month’s election, has pledged to cap standard energy tariffs, while the opposition Labour party has proposed nationalising some energy firms. E.ON group CEO Johannes Teyssen said a price cap would unlikely have any impact on E.ON’s current portfolio. “It’s an opportunity to define and develop new products, it’s a challenge for us,” Teyssen said on the sidelines of the FT Energy Transition Strategies conference in London. E.ON, whose British unit saw profits plunge 43 percent in the first quarter, is ramping up sales in Britain to gain new customers in a market where large suppliers have seen fierce competition from new entrants. The Conservative party is expected to dilute the threat to energy suppliers with watered down plans to cap bills ahead of a fresh review into the rising cost of Britain’s electricity. The Tory party said its ambition is for Britain’s energy costs to be the lowest in Europe, and its manifesto included plans to reignite the shale industry by offering a bigger slice of a sovereign wealth fund to those who welcome local drilling. “We want to make sure that the cost of energy in Britain is internationally competitive, both for businesses and households,” said the party. The pledge made no mention of the £100 savings for 17 million customers promised by Theresa May earlier this month. #torymanifesto has energy price cap as expected but leaves significant wiggle room re: nature and scope of cap. £100 figure doesn’t feature. 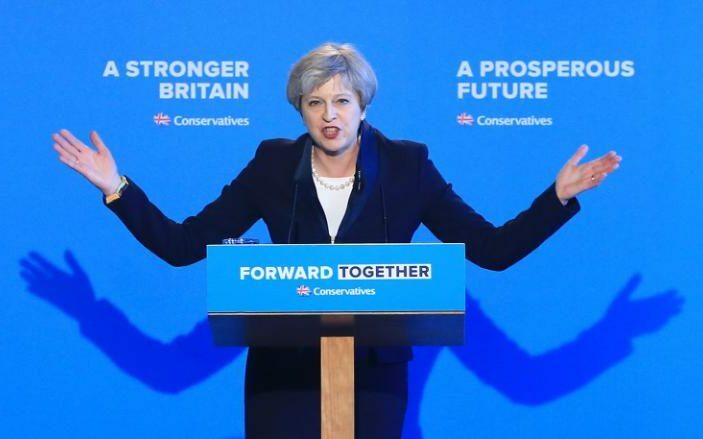 A new addition to the Tory party manifesto is the pledge to tackle concerns over rising energy bills by putting in place a safeguard tariff cap for an unspecified number of consumers who are on the poorest value tariffs. The cap will also include bills paid by micro businesses. “The manifesto wording was vague, as expected, but hints that the impact for the industry may be much less than we feared,” said Deepa Venkateswaran, an analyst at Alliance Bernstein. Mrs May had promised a hardline, market-wide cap on all standard household energy tariffs but the party line appears to have softened the stance following fierce criticism that the move would stifle competition. The party has promised to maintain the competitive element of the retail energy market by supporting initiatives to make the switching process easier and more reliable. “Alongside giving individuals greater control over their energy bills and protecting customers from unfair bills, we will help them to save energy,” the party added. Its energy efficiency drive would include a commitment to upgrading all fuel poor homes by 2030 and revising requirements for new homes too. “An energy efficient home is a more affordable and healthy home,” the party said. It came as a relief to the beleaguered energy industry which has lost hundreds of millions of pounds in market value since the price cap plans emerged. SSE shares rose 2.3pc to around £15 and Centrica climbed 4pc to £2. Ms Venkateswaran said the manifesto suggests that the cap is not intended to save money on current bills but to prevent future unfair price hikes. On this basis the starting point for the Government cap would be the highest standard tariff in the market, rather than the average, and would sit just above current ‘reasonable prices’. Meanwhile the long-held Tory support for shale gas is set to continue. The party dusted off plans first put forward by former Chancellor George Osborne in 2014 for a sovereign wealth fund. Under the latest plan it will pay shale revenue directly to individuals as well as for the benefit of the country at large. Reality Check: Why does Labour want to control National Grid? The leaked version of the Labour Party manifesto commits to “take energy back into public ownership to deliver renewable energy, affordability for consumers, and democratic control”. Part of that would involve “central government control of the natural monopolies of the transmission and distribution grids”. Natural monopolies are businesses where there are no benefits to be had from competition. They are usually areas where there is a lot of initial spending on infrastructure needed, such as train tracks or water pipes. It does not mean there can only be one business serving the whole country, but it makes no sense to have companies competing to provide such services to consumers in a particular area. It would be inefficient, for example, to have two taps in your sink offering water from different providers or two sockets in your wall with electricity from competing energy companies. Being a natural monopoly gives businesses enormous market power, which means that they must be regulated. Whether it is better to have such services provided by government or by private companies regulated by government is a matter of political opinion. National Grid’s main business is moving electricity and gas round the country. This is known as transmission. The very last leg of the journey into people’s homes and businesses – known as distribution – is done by a number of different companies. National Grid does own a stake in Cadent Gas, a distribution firm, but most gas distribution and all electricity distribution is controlled by other firms. The cost of transporting gas and electricity round the country accounts for 29% of the average dual-fuel (both gas and electricity) bill, according to Energy UK, up from 23% in 2010. But National Grid says its share of that – the transmission cost – is only 5% of the typical electricity bill, and 3% of a gas bill. The rest is distribution costs. Owning the transmission and distribution network would give the government considerably more control as it attempted to deliver promises in the leaked manifesto to deliver renewable energy and affordability for consumers, including keeping the average dual fuel bill below £1,000 a year. The leaked manifesto also pledges to ban fracking (the use of high pressure liquids to extract gas from rocks) and use carbon capture (stopping carbon dioxide from escaping with other waste gases) as it moves to cleaner fuels. Control over the network might help with this, but the government via its regulator and planning decisions already has a big say over the future energy mix. Just nationalising National Grid (which is worth about £38bn on the stock market at the moment) would not achieve what Labour is promising – it would give the government the company that owns the UK’s electricity and gas transmission (it might also leave the government owning National Grid’s energy business in the US). The distribution part of the equation is a slew of other companies – for gas alone it would be SGN, Northern Gas Networks, Wales and West Utilities, as well as Cadent Gas. But the leaked manifesto calls for control of these companies, which could possibly be achieved by buying stakes in these businesses rather than nationalising them. BBC business editor Simon Jack says National Grid’s UK business is estimated to be worth about £25bn. National Grid has a lot of shareholders. It’s been listed on the London Stock Exchange since 1995. Its shareholders, including 880,000 small shareholders, would be very upset if they didn’t get a good price from the government for their shares. There are not many precedents for nationalisation of profitable companies in the UK – companies are usually nationalised when they are in financial difficulties – so it is not clear at this stage what the process would be. The rising cost of electricity contributed to inflation’s rise to 2.7% in April, its highest level in three and a half years. Increases in the cost of clothing, car tax and air fares were also blamed by the Office for National Statistics for the rise in consumer price inflation (CPI) that exceeded City forecasts of 2.6%, and soared above the previous month’s figure of 2.3%. With wages increasing by just 1.9%, the new inflation figure highlights the growing pressure on living standards and consumer spending. The Bank of England predicted last week that inflation would peak at 2.7% in the summer. However, the ONS said producer output price inflation was above 3%, indicating that further rises in inflation could be expected. Alan Clarke, an economist at Scotia Bank, said he expected further electricity and gas price rises and that an acceleration in food price rises would push CPI inflation to 3.25% in the autumn. “We remain convinced that the market is underestimating the further upside for inflation from here,” he said. Clarke argued that the retail prices index (RPI), which includes some housing costs, was already at 3.5% and would rise to 4.25% before the end of the year, putting extreme pressure on consumers to cut back spending on non-essential items. The National Institute for Economic & Social Research (NIESR) forecast last week that British workers will see their disposable incomes shrinking this year as a result of rising inflation that will peak at 3.4%, while average wage rises are capped at only 2.7%. Howard Archer, chief UK economist at IHS Global Insight, said rising inflation would put a further squeeze on real incomes and force Threadneedle Street to delay any move to raise interest rates. “The Bank of England will most likely sit tight on interest rates through 2017 and 2018 – and very possibly well beyond. “We suspect it will end up remaining tolerant on the inflation overshoot given likely limited UK growth and the prolonged, highly uncertain outlook that the UK economy will face as the government negotiates the exit from the EU,” he said. The TUC general secretary, Frances O’Grady, said the government needed to protect workers from a slump in real wages. “Working people are still £20 a week worse off, on average, than they were before the crash. That’s why living standards must be a key battleground at this election,” she said. But Scott Bowman, UK economist at Capital Economics, was more optimistic that inflation would be held in check. He said many of the elements pushing up inflation were one-off factors and their effect would wane over the coming months. “The sharp rise was mainly due to factors that, while they won’t be reversed, shouldn’t be repeated. Indeed, a large part of the rise in inflation reflected air fares reversing the previous month’s fall as a result of Easter shifting from March last year to April this year. “What’s more, vehicle excise duty rates rose this April and tobacco and alcohol duty increased by more this year than they did last year,” he said. EDF’s renewable arm has confirmed plans to buy a majority stake in an onshore wind power developer. EDF Energies Nouvelles said it has reached a full and final agreement with the shareholders of FUTUREN to buy a 67.2% interest in the company. FUTUREN has operations in France, Germany, Italy and Morocco and currently operates around 745MW of assets in those countries. The deal remains subject to the approval of the German competition authority. ScottishPower’s first quarter results show its retail supply business saw profits fall by £81m, which it blamed on higher costs and mild weather conditions at the start of the year. The independent energy company behind the retail market’s cheapest deal has shut its doors to new consumers amid concern over its mounting complaints and wafer thin cash reserves. Iresa Energy is one of almost fifty challenger brands to the big six legacy suppliers but it has set itself apart by offering a rock bottom dual fuel supply tariff at an average price of £834 a year. However, the company has slammed the brakes on its rising popularity after the regulator warned the company to get a handle on an increasing number of complaints from its customers. “We told Iresa they needed to resolve this problem and have asked them to explain to us how they will ensure that it is easy for their customers to contact them and provide them with a level of customer service they are entitled to,” he said. Iresa was not available to comment on its customer service or its decision to close the supplier to new customers. The company’s meagre cash balance has also raised concern that Iresa may be the next casualty of rising energy company costs after the collapse of GB Energy due to the steady rise of wholesale market prices and other costs. Iresa held just over £12,300 in cash and debt of almost £90,000 at the end of 2015 according to its most recent publicly available financial results which were posted to Companies House in September. Ofgem has raised hackles among established energy companies by stopping short of setting minimum collateral requirements for new suppliers. Instead it oversees a scheme which bails out the customers of failed energy companies using a safety net paid for by other suppliers, many of whom may have lost customers to under-funded suppliers offering unsustainably cheap deals. A Consensus Busting Election on Energy Policy? Contradicting months of definitive denials about the prospect of a general election, Prime Minister Theresa May announced a snap election this morning, set to take place on 8 June. Purdah could commence on the 4th May five weeks ahead of election day. It is widely expected that the election will be dominated by Brexit. That’s no great surprise. But the presence of so dominant a single issue, and in the context of an opposition in obvious difficulties, the real question is what latitude this gives to the Conservative Party to push the envelope on other policy areas? These factors leave plenty of less illuminated space in their manifesto, to pursue what would otherwise be considered difficult or controversial policies. The temptation is obvious if these positions are likely to poorly scrutinised or challenged by opposition parties with eyes on internecine warfare (Labour) or on Brexit (Liberal Democrats). One area of obvious attraction to certain parts of the Conservative Party will be to continue to erode levels of commitment to dealing with climate change, and to decarbonisation. The Conservative journey down this road has already begun, and continues a pathway set out in the last election manifesto in 2015.The Cameron era manifesto centred on “affordable, reliable energy” being “critical to our economy, to our national security, and to family.” Specific pledges included banning any new onshore wind and promoting competition through implementing the recommendations of the Competition and Markets Authority investigation. The only novel policy ideas recently have centred on the increasing prominence of the Industrial Strategy and government support and focus on key areas of the economy. Generally, it is clear that the trilema has already been very nearly toppled off its perch in this Parliament by a dualema in form if not in legislative substance, where security of supply and cost of policy take pre-eminence over decarbonisation. Whether the voices proposing further movements in this direction within the current government win out or not in explicit policy commitments in the conservative election manifesto this time is not a given. The Conservative Party is a broad church and there are plenty of climate change activists in its ranks. However, there is a clear ideological thread that appears to link Brexiteer factions and climate change scepticism. In the current balance of party power that prevails that may tip the balance towards an agenda that really shakes up the cross party, low carbon energy policy consensus. This is a consensus that has existed at least since the turn of the millennium, and is emblematically embodied in the Climate Change Act 2008. Arguably, with this election we are as close as we have ever been to a reversal in policy that could threaten the 2008 Act. It doesn’t mean that there will a manifesto commitment to its repeal but even considering the risk of it happening is is a profound state of affairs and signals just how far the energy policy landscape has changed, and how quickly. Whether we see this radical shift remains to be seen. In any event an immediate and real impact of the election is the uncertainty and delay this will bring to much needed policies. So, at the very least it will put back much needed changes and refinements to policy, even if the current shaky accommodation of the trilemma is maintained. The promised new accounting controls for low-carbon scheduled for November, but can this timetable now be met? The UK was already on the cusp of an energy infrastructure investment hiatus because of Brexit, the possibility of a further Scottish Independence referendum, as well as the poor management of policy changes in areas such as embedded benefit reform. The election announcement merely adds to this unhelpful cocktail , adding considerably to the many unanswered questions hanging over UK energy policy. It may even be a direct contributor to further uncertain political inflexion points. For example, if the SNP takes 55+ seats, again then the calls for a second Scottish independence referendum will only become more deafening. So, at the very least the election on June 8 will herald challenges in making timely decisions on the critical policies we adopt in pursuit of the destination of a low carbon future. However, we believe, more fundamentally, it may also change that destination altogether.